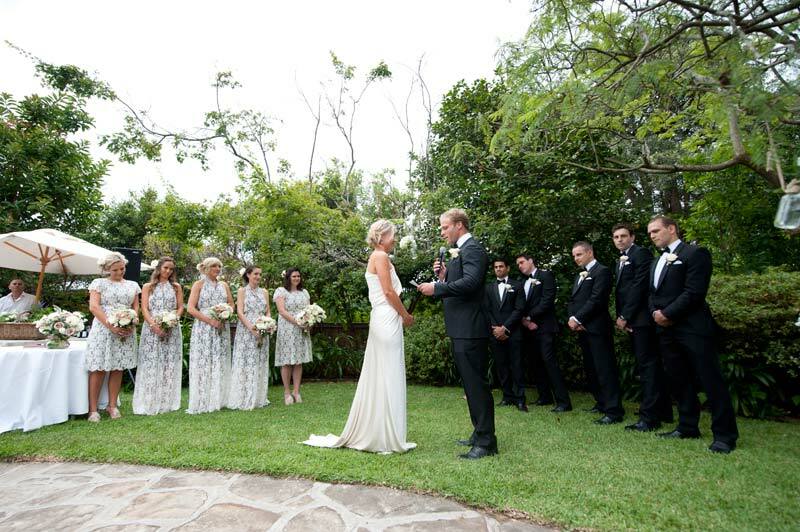 Under the delicate purple flowers of the Jacaranda tree Annabelle and Jarrod affirmed their love for each other in an elegant and heartfelt ceremony. They met through mutual friends and love blossomed instantly for Annabelle and Jarrod. Seven years later, after a late-night carriage ride in Melbourne's Botanic Gardens, Jarrod asked for Annabelle's hand in marriage. They shared a dream of an intimate and rustic white wedding and set the date for five months later. They hired Cameron Bloom as photographer, his expertise and eye for beauty instantly impressed. "His shots capture our entire day. Every detail from the ceremony to the reception, every emotion was caught and we have some fantastic candid shots of our guests which are amazing! " says Annabelle. Loving the intimacy of a garden wedding, they held their nuptials in the stunning grounds of a relative's home. Carrying an unstructured bouquet of white flowers, Annabelle delighted in the falling tears of joy from her husband-to-be. Only two days before the wedding date she swapped her bespoke Helen English gown for an entirely new design. "I spotted a dress in Helen's boutique and she, along with her amazing team, spent twenty four hours tailoring it," says Annabelle. The last-minute decision was a good one - Annabelle looked absolutely stunning in her contemporary gown - the epitome of a chic, elegant bride. 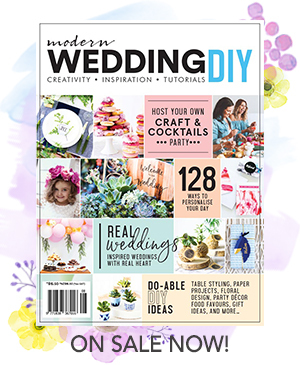 After enjoying the ceremony, peppered with meaningful, hand-selected readings, the newlyweds invited their guests to celebrate in the timber-floored marquees. On the four sprawling dinner tables, fragrant herbs and flowers flowed abundantly from glass milk bottles, jars, pots and wooden crates. Bunches of willow branches adorned with white buds to mimic cherry blossoms clung to the rafters- an elegant touch. Self-confessed foodies, they ensured that their guests dined on a delicious selection of fresh and seasonal produce, slow-cooked and seasoned to perfection. Amidst the beauty of the day, the elated couple were still able to find space for fun and laughter, entertaining their guests by attempting a Dirty Dancing-style lift during their first dance. As parting celebratory gifts, they offered their guests bunches of lavender tied with hessian and a poem, written for the occasion by the Annabelle's sister. They took a delayed honeymoon to Mexico and now live in Melbourne. P.s For more real wedding inspiration check out our real weddings page.